UVic mechanical engineering student Simon Park with the Caboost at UVic. When the dream is to land work with an innovative, world-renowned company inundated with applicants vying for a spot, it helps to stand out. Happily for UVic mechanical engineering student Simon Park, he does. 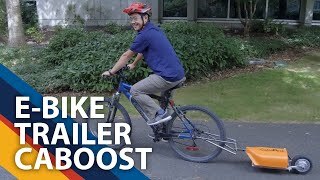 Park is the 21-year-old inventor of the Caboost, which converts any bicycle into an e-bike simply by attaching a small electric bike trailer that provides an electrical assist when needed. Park came up with the Caboost to spare himself the hilly ride to school every day, but he now credits his invention for helping him land a coveted eight-month internship he began this month with Tesla Energy in Palo Alto, Calif. He believes the Caboost was what caught the eye of the weary Tesla recruiter a year ago at the end of a long day on campus seeking students for internships. Not enough to actually land an internship right there and then, however. Park went through five interviews with the company after that, and still didn’t clinch a Tesla placement. But armed with the recruiter’s email, he pressed his case. “I kept emailing him. I tracked him down on LinkedIn. Getting a co-op with Tesla was something I really wanted,” says Park. He’s now working in the reliability department of Tesla’s energy division, which produces the Powerwall, a solar-charged mega-battery for people wanting solar power as their primary household energy source. “Everyone thinks of Tesla for cars, but it’s more of an energy company than a car company,” says Park. Park is one of 44 UVic co-op students to have landed an internship with Tesla over the years. He's pictured here at Tesla's California training centre. Park is excited about the opportunities for learning that his Tesla internship will provide, some of which might even be applicable to his Caboost project down the line. Everything about the Caboost has been a learning experience, he adds. Park says staff at UVic’s Coast Capital Savings Innovation Centre were “the first people to believe in me” for the Caboost project. The South Island Prosperity Project, an economic development initiative for the Capital Region, became “a huge supporter” after Park won the $15,000 Smart South Island Innovation Challenge in March. UVic has supported the initiative in so many ways, he adds. This summer, Park was a client for a group of UVic electrical and software engineering students who created a smart control system for the Caboost as their capstone project. UVic computer scientist Mantis Cheng turned over his lab for the entire summer so the team had a place to work. Park returns to UVic in the spring to finish a final academic term before graduating as a mechanical engineer next year. Park at a Tesla showroom. Park at Tesla's California training centre.